Spoleto (Latin Spoletium) is an ancient city in the Italian province of Perugia in east central Umbria on a foothill of the Apennines. It is 20 km south of Trevi, 29 km north of Terni, 63 km southeast of Perugia, 212 km southeast of Florence and 126 km north of Rome. Spoleto occupies a strategic geographical position due to its location at the head of a large, broad valley, surrounded by mountains. It appears to have been an important town to the original Umbri tribes, who built walls around their settlement in the 5 C BC, some of which are visible today. Spoleto was situated on the eastern branch of the Via Flaminia, which forked into two roads at Narni and rejoined at Forum Flaminii, near Foligno. An ancient road also ran from Spoleto to Nursia. The Ponte Sanguinario of the first century BC still exists. The Forum lies under today's marketplace. The first reference to Spoletium is the notice of the foundation of a colony here in 241 BC and it was still, according to Cicero (Pro Balbo), "colonia latina in primis firma et illustris": a Latin colony in 95 BC. After the Battle of Lake Trasimene (217 BC), Spoletium was attacked by Hannibal, who was repulsed by the inhabitants. During the Second Punic War the city was a useful ally to Rome. It suffered greatly during the civil wars of Gaius Marius and Sulla. The latter, after his victory over Crassus, confiscated the territory of Spoletium (82 BC). From this time onwards it was a municipium. Under the Roman empire it seems to have flourished once again, but is not often mentioned in history. Martial speaks of its wine. 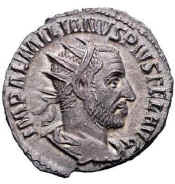 Aemilian, who had been proclaimed emperor by his soldiers in Moesia, was slain by them at the Sanguinarium bridge, between Oriculum and Narnia near Spoletium on his way from Rome (253), after a reign of three or four months. Rescripts of Constantine (326) and Julian (362) are dated from Spoleto. The foundation of the episcopal see dates from the 4 C. A letter to the bishop Caecilianus from Pope Liberius in 354 constitutes the first historical mention of Spoleto. Owing to its elevated position, Spoleto was an important stronghold during the Vandal and Gothic wars. Its walls were dismantled by Totila. Under the Lombards, Spoleto became the capital of an independent duchy, the Duchy of Spoleto (from 570), and its dukes ruled a considerable part of central Italy. In 774 it became part of Holy Roman Empire. Together with other fiefs, it was bequeathed to Pope Gregory VII by the powerful countess Matilda of Tuscany, but for some time struggled to maintain its independence. In 1155 it was destroyed by Frederick Barbarossa. In 1213 it was definitively occupied by Pope Gregory IX. During the absence of the papal court in Avignon, it was prey to the struggles between Guelphs and Ghibellines, until in 1354 Cardinal Albornoz brought it once more under the authority of the Papal States. After Napoleon's conquest of Italy, in 1809 Spoleto became capital of the short-lived French department of Trasimène, returning to the Papal States within five years, following Napoleon's defeat. In 1860, after significant resistance, Spoleto was taken by the troops fighting for the unification of Italy. Spoleto © ammonet InfoTech 2008 - 2018. All rights reserved.